Shopping Cart Abandonment Rate = 1 – (Number of Orders Placed / Number of Shopping Carts Created) I bet you just did a calculation on your shopping cart abandonment rate. It’s a scary number, no? I understand, which explains the purpose of this post – to dish out tips and tricks on optimising your online shopping carts so customers will go through with their purchases. According to this Ecommerce Checkout Usability Report generated by Baymard Institute (independent web research institute), the average abandonment rate for online shopping carts is about 68% - an alarming percentage! Guys, you are losing 68% of your sales! 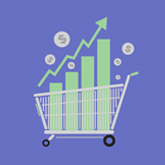 In essence, shopping cart abandonment highlights the opportunity for retailers to recover lost sales by addressing primary drives to leaving the purchase uncompleted: frustration with the amount of shipping costs, unpreparedness to make a purchase, need for transparency on product information, and many more. Based on this Forrester study, 44% of customers undergo shopping cart abandonment because of high shipping fees. Similarly, 22% do not check up checking out because the website does not mention shipping costs at all. On top of that, this study from the E-tailing Group reveals that the most important factor that pushes customers to complete a transaction happens to be unconditional free shipping. Apparently, 73% of respondents cited unconditional free shipping as ‘critical’. It may be not feasible to fully eliminate shipping costs on your site all the time, but don’t underestimate the power of organising a couple or more free shipping promotions throughout the year. Furthermore, your shoppers are likely to buy additional products because of the free shipping, as 93% of respondents from a study by Compete indicated that free shipping on orders would encourage them to buy more products online. This means that footing the shipping bill could result in tons of new sales for you! Shipping costs not only weigh heavily on consumers’ decisions to purchase products online, but also impacts consumer satisfaction. eCommerce is all about convenience and price, and additional shipping costs contradict both of these features. In short, free shipping can win you big points with your customers. 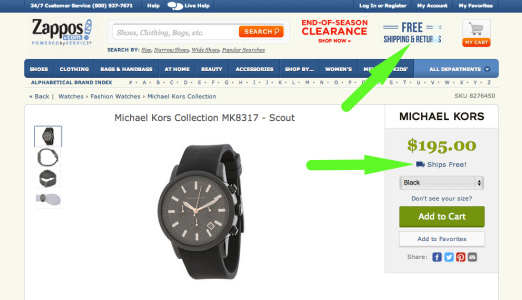 Just look at Zappo’s shopping cart, they emphasize free shipping at the top right hand corner of the page, and also below the price on every specific product page. Customers also hate additional surprise charges as they are about to check out. WebCredible’s survey indicates that 49% of online shoppers abandon their purchases because of hidden fees that are only revealed upon checkout. But how are you going to introduce additional variable charges such as sales tax and specialised shipping if your customers dislike unwelcome surprises like that? 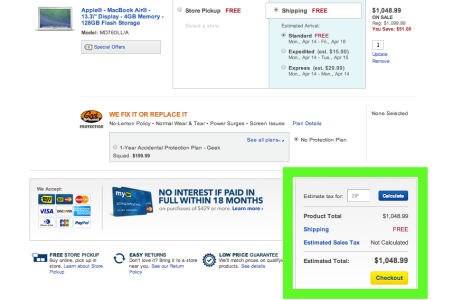 One way to get around this problem is to add a calculator or an estimate within the shopping cart as early in the process as possible. For example, Best Buy’s shopping cart has a built-in sales tax calculator to avoid any additional surprise charges for customers. Making your customers backtrack and navigate your website just to find products in their existing shopping cart and check items ready for purchase. Although it is simpler from a technical standpoint to create customer shopping carts on a separate page from your eCommerce front site, consumers need ready access to the cart regardless of the page they are on. In a report by Internet Retailer, Movies Unlimited allowed its online shoppers to see their existing cart via a dropdown menu, rather than requiring them to navigate to a separate page. This contributed to a 4-8 % decrease in shopping cart abandonment. 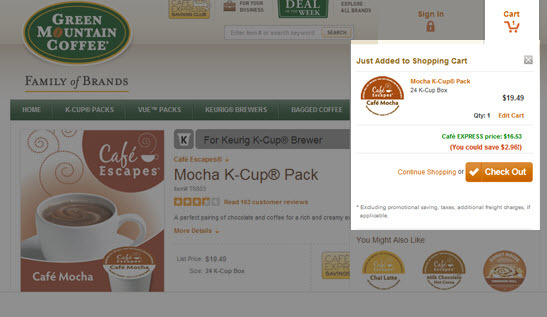 The screenshot below from the buying process on Green Mountain Coffee’s online site highlights this kind of feature in action. The shopping cart shows up on the top right hand corner of the screen whenever you add a new product to the cart. 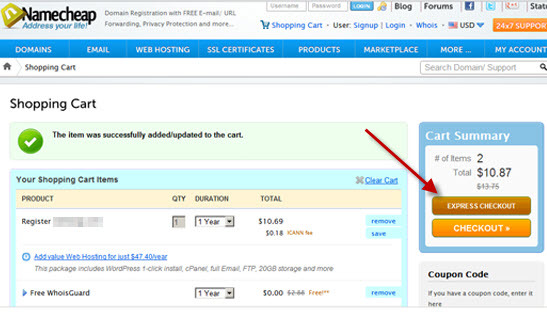 The cart is also easily viewable if customers want to check it as they are shopping. The WebCredible report also states that about 10% of consumers display shopping cart abandonment tendencies because of lengthy checkout processes, including multi-page checkouts that keep presenting customers with additional forms, questions, or products before allowing them to go through with the transaction. On the Internet, time is of the essence, a checkout process with many steps and pages can appear daunting and difficult, and amounts to frustration. Conversion optimisation guru, Bryan Eisenberg recommends using no more than four steps, and conducting A/B tests on your eCommerce site to see definite impacts on conversion rates. 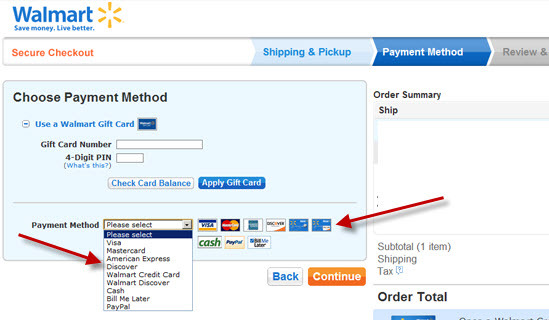 But for the retailers who think that additional options are necessary, search for solutions that integrates the ‘Express Checkout’ feature during the online shopping process where upon viewing their cart, customers can have the option to immediately check out and complete the purchase. Just because a customer has abandoned his or her cart, it does not mean that all is lost and no further effort should be put in to pursue this customer. In the same report about Movies Unlimited, there was a 1.5 per cent increase in transactions just by sending out emails to remind consumers of their abandoned carts. As a result, customers either purchase the ‘abandoned items’, save them for later, or clear the cart. This move makes sense because the Forrester study also found out 41% of online shoppers who abandon their carts do so because they are unprepared to make the purchase. Most customers expect that their carts will remain intact when they return. So on your eCommerce store, you should give customers the option to complete their purchase when they are ready. Besides sending email reminders, another way to invite customers to return to abandoned carts is the ‘Save For Later’ or ‘Wishlist’ feature, prevalent in most online shopping carts from established retailers. Amazon is a leader in this department with several ‘Wishlist’ features. 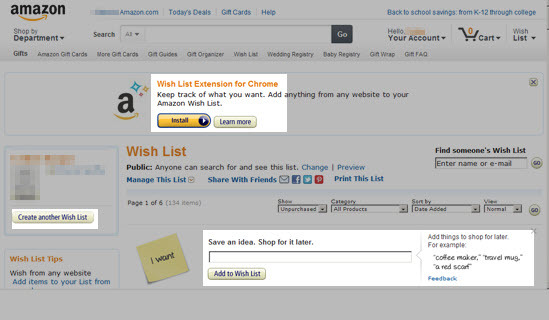 For example, you can create multiple wishlists, add a ‘Wishlist Add-on’ for your browser so you can bookmark items from other websites, and also jot products down and shop for them later. In addition, when they see that you have browsed specific items or categories, they send you fully customised emails reminding you to buy those items. Webcredible’s study shows that 29 per cent of online shoppers do not like proprietary registration forms during check out. In fact, one respondent stated that because of their existing number of passwords and IDs, they feel inconvenienced when yet another service requires them to create an account. But how can you track customer activity without irritating your customers? Walmart, again, is a great example of this. As you are checking out, they give you three options for your account. You can login with your existing Walmart account, register for a new account now, or wait until later to create your own Walmart account. This puts less pressure on customers, knowing that they can complete the transaction without registering. 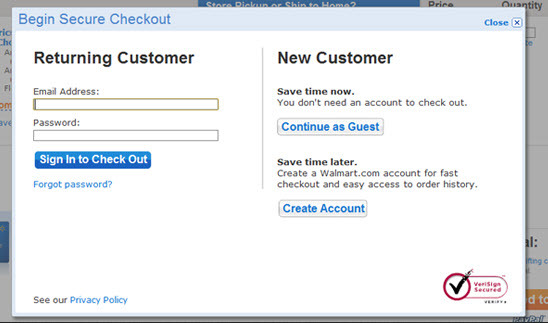 Also, try allowing guest checkouts and test how much it impacts conversion. E-tailing’s Connected Consumer survey shows that the website features online shoppers find essential are high quality images, the ability to see the item in their preferred colours or styles, browsing alternate views of the item, and the zoom functionality. 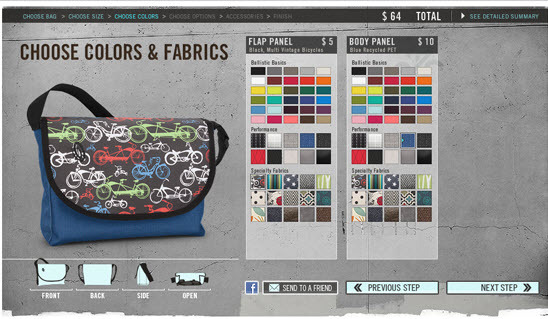 Take a look at Timbuk2, the product pictures dominate the screen, can be viewed from different angles, and clearly display what the item will look like when you have customized it. Wonderful, isn’t it? The E-tailing survey shows that 62% of online shoppers think that it is important for an ecommerce website to have sections for specially priced items. These include items on sale, coupon codes, and products being cleared from inventory. For instance, sale items are prominently displayed on eCommerce stores of prominent websites, including specially assigned sections for sale and clearance items. This is an obvious one. Customers won't complete an eCommerce transaction if they don't trust you. A survey conducted by Statistia shows that 17% of shoppers don't purchase because they are concerned about security. If you don't have an SSL certificate, security badge, lock icons, or privacy policies, be prepared to lose the majority of your site visitors before the online purchase is complete. Such security assurances can ease a customer's fears of sharing personal information with you, just remember to place them where customers feel the most anxiety, near the credit card field for example. In an A/B test published by Get Elastic, adding just the McAfee security badge on the checkout page increased sales by 4-6%. As a bonus, here's an extra tip: maintaining transparency on product availability on you eCommerce site goes towards battling shopping cart abandonment as well. An inventory management system comes in extremely handy in keeping an eye on your stocks and managing them. Nothing frustrates a customer more than having completed all steps of the check out process only to find that the item they want is out of stock or needs backordering. The stock level of the product should be displayed upfront along with the rest of the product information. TradeGecko is a fantastic solution for you to monitor your stock levels and smoothen out backend processes. For example, when stock levels drop to a critical number, the system even prompts you to reorder goods in time! Also, the TradeGecko online inventory management system is integrated with major ecommerce platforms like Shopify and WooCommerce. The integrations boost your operations productivity so you can worry less about backend tasks and focus more on other aspects of your business. Lastly, this infographic by Monetate, digital marketing consulting firm, sums up the points in this infographic nicely. These suggestions do not just go toward improving conversion rates, they help boost customer and user experience on your online site as well. By applying even just a few of these tips to your website, you will see a significant decrease in shopping cart abandonment for your ecommerce business. What are you waiting for? How can SMEs leverage Fintech solutions to be more successful?